Now Available: Mini Strategy Sessions! Raise your hand if you have big dreams and a not-so-big budget for your small business. Need help with a specific question or problem. Don’t have much time or money to spend. Don’t even want to start wrapping your brain around hiring a writer for a big project. In fact, the idea of it makes you want to run for the hills. In fact, let’s start miniature. For all of you who need a little boost in the communications department, I have a brand-sparkling-new offering: mini strategy sessions. When you’re mired in the day-to-day of running your business, it can be tough to get a clear look at what’s happening with your communications. How can I get more website traffic? How can I get higher quality leads from my website? What the heck should I do with my about page? What should I write about in my email newsletter? We’ll chat for half an hour, in person or via Zoom. Then I’ll follow up with recommendations and resources. If you find a time you like, go ahead and sign up! I’ll send you an invoice to secure the time. If you don’t see a time there, send me an email at hello@kelleygardiner.com and we’ll find something that works. After your time is secured, I’ll check in with you (over the course of a five-minute call or a couple of emails) about your big question, so I can be prepared for our meeting. Then it’s just a super casual chat where we discuss what you’ve been doing and what results you would like to see. I follow up with you within a few business days with more recommendations. You take those recommendations and run with them! 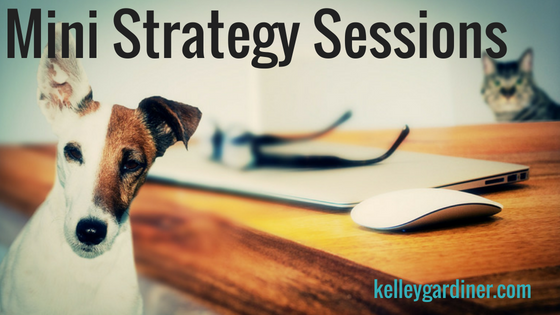 When you book in July or August, mini strategy sessions are just $49. *I’m a writer, not a philosopher, so I am not able to make any promises about answering your existential questions.